Educational research suggests that signs can help young children with Down syndrome to learn new words and to communicate more. This knowledge helps parents and therapists to support the children's early language development. 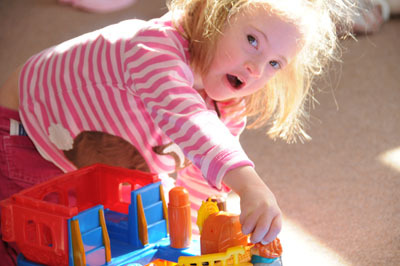 In the 1980s practitioners began to observe that if parents were taught to use signs with spoken words when talking to their babies and toddlers with Down syndrome, the children began to use signs to communicate before they could say the words. It appeared that signs increased the children's ability to communicate and reduced frustration. Signs also enabled the children to show that they understood more than had previously been assumed. The signs children used increased their total productive vocabulary between mental ages of 14 to 26 months (around 2 to 4 years of chronological age). In other words they could sign words they could not yet say so signs were important in allowing them to say more. The children used more signs in the early stages of language development and as their spoken language developed, use of sign and spoken word became equal. Most showed a great increase in spoken word between mental ages of 23 to 26 months (around 4 to 5 years of chronological age). As spoken language improved, use of sign decreased. Miller concluded we have evidence that using signs does increase early vocabulary learning and communication but only at this early stage. 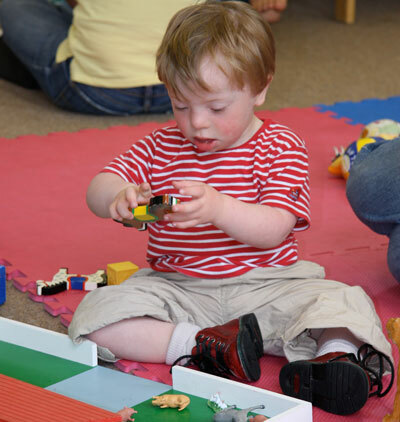 This paper and other studies of the benefits of sign use led to most practitioners in speech, language or early intervention programmes encouraging parents to sign with their babies and toddlers with Down syndrome. This is helping the children's early language development. How does signing influence the next stage of language development - as children start to join words together as they talk and learn to use grammar such as plurals, possessives and tense markers? Does focussing on signs lead to parents missing children's first attempts to say words? How does using sign effect the development of clear speech - if a child can make themselves understood with a sign maybe there is less pressure to improve the clarity of words? Miller (1992) Development of speech and language in children with Down syndrome. In Lott, McCoy, Eds. Down syndrome: advances in medical care Wiley-Liss.